After being gone all summer and only a few episodes earlier in the year, we're bringing the podcast back! Omar De La Rosa joins us this week to talk about Green Day's secret show. We play a little bit of their new song, 'Amy', and cover a couple new things going on around the site. For links to all the topics we covered, visit this topic on the forum. 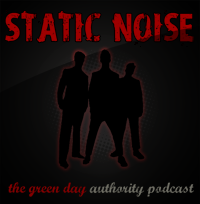 Be a part of the show, email us (staticnoise@greendayauthority.com) or post a message on the Static Noise Facebook Page. Or right click this link to save the mp3. Better yet, you can subscribe to the show in iTunes to get the latest episodes automatically when they're published.